It has been a while since the Muscat Magpies, from Oman in the Middle East, have taken to the field. In fact, it was during the 2014/15 season that the club formally announced that it would cease playing in the AFL Middle East competition. Since then they have left the door open for a return and slowly worked towards a possible return. Last week, the club hosted the Multiplex Bulls in an International Rules match – a step towards something bigger down the track. The following article from Alex Broun at Sport 360 looks at the game. The first ever International Rules match was played in Muscat with the Multiplex Bulls taking on GAA Oman in an exhibition match. Hosted by the Sultan’s School, Seeb, 20 Bulls players made the trip from Dubai to play the landmark match, which is a hybrid of Gaelic football and Australian Rules, on Friday. The GAA team was made up primarily of all Irish ex-pats, plus two Omani’s and three guest players from AFLME’s Dubai Dragons. There is a close link between Oman and the AFLME as the GAA still include Muscat Magpies Aussie Rules as a part of their club, although the Magpies have not taken part in the league since 2014. The game was played in great spirit with both sides taking some time adapting to the new format. The main difference for the Bulls was playing with the round ball and for the GAA it was getting used to the heightened physicality of tackles. It was tight for the majority and the Bulls headed into three-quarter time with just a six point lead. But the final stanza saw the UAE side score some crucial “goals” (worth six points and scored when the ball hits the back of the net) and they ended up winning 6.5.16(67) to 2.8.10(46). Will Cook in goal for the Bulls was crucial to the win, making four to five big saves, while Ted Stobart and Joseph Yodgee were the difference up forward scoring five goals between them. For Oman, Kieran Sheridan and Paul Early were the key players who got the “Irish” back into the game and were also helped by Australian Luke Byron who was impressive in his first ever game with the round ball. Locals Rashid Alsawafi and Hamdan Ali Almaamari also did their home country proud, proving to be vital up forward in the second half. 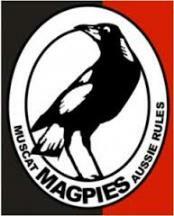 The long term aim of the match was to get the Muscat Magpies to rejoin the AFLME in 2018-19, playing the compromise rules format. Further discussions will hopefully end with the Magpies being involved next season. AFLME will resume on February 2 with Dingoes playing Dragons and Falcons playing Bulls.